There is a troubling lack of understanding about what has really been happening in Catalonia over the past year. Some left commentators have been quick to label this the ‘return of Franco.’ Others have dismissed the police violence, the political prisoners and the shutting down of a democratically elected government as a reasonable reaction by a vulnerable state trying to prevent a damaging split. To outside observers, the mode of arrival of 10,000 Spanish national police and Guardia civil in Autumn last year, accompanied by threats to ‘cut off’ Barcelona’s power supply and place the city under siege, did look like the response of a dictatorship. Well, it looked somewhat like a comedy dictatorship. Spain commissioned three ships to transport and accommodate officers, and the most visible one, moored in the port of Barcelona, inexplicably came emblazoned with gargantuan images of the ‘Looney Tunes’ cartoon characters Wile E Coyote, Tweety-Pie and Daffy Duck. Perhaps this is one reason why linking Franco to this ‘Looney Tunes’ invasion seems hugely overblown; it is a connection that – outside Catalonia – people find difficult to take seriously. In order to fully understand the Spanish government’s over-reaction, we need to grasp precisely what happened following the transition from the dictatorship. The Spanish transition was in many ways unique to Europe. Of the countries that were under the iron heel of fascism in the 20th century (Germany, Italy, Greece and Portugal and Spain) only Spain deserves the description ‘postfascist.’ Italy and Germany passed through different processes of cleansing fascism from government in the post-war settlement; Greece and Portugal were exposed to processes of reparation, memory and indeed criminal trials that helped expel fascism from the establishment. This was not the case in Spain. It is Franco’s nationalist flag, not the republican tricolour that remains the Spanish flag. Spain’s national day is the 12th October, the anniversary of the arrival of Christopher Columbus in the Americas. This is Franco’s “day of the race” that explicitly celebrates the conquistador traditions of Spain and remains closely bound to a colonial, anti-republican nationalism. The ongoing public funding of the Franco Foundation, the preservation of the Duchy of Franco (a hereditary title gifted to the Franco family by King Juan Carlos), the statues of the Dictator in public places and the streets named after him, are all examples of the cultural endurance of the emblems of fascism at the heart of the Spanish aristocracy and the Spanish state. When Juan Carlos’ son Felipe made an unprecedented TV address on the 3rd October last year, his explicit condemnation of Catalonia and its institutions for their disloyalty opened the political space for the constitutional suspension of the Catalonia government. The Spanish government’s tough clampdown in Catalonia is justified exclusively on opposition to Spanish statehood and the monarchy. And this explains the dramatic punitive turn against insubordination show to the monarchy in Spain. The rapper Valtonyc was forced to flee into exile to Brussels to avoid a possible three years of imprisonment for his anti-royalist lyrics. Another hip hop singer, Pablo Hasel, is currently facing trial for ‘hate speech’ against the monarchy. The intolerance of insubordination has significantly intensified since the 1st October referendum. A major art exhibition on “Contemporary Spanish Political Prisoners” by the artist Santiago Sierra was banned and removed by the authorities in Madrid earlier this year. The spectacle of police confiscating yellow banners, ribbons and balloons from football fans and the banning of the use of the colour yellow by human rights activists is perhaps one of the most extreme and preposterous manifestations of the state’s complete pulverisation of any discussion of the political prisoners. And yet, the ‘banning’ of the colour yellow in public places mirrors precisely the logic of the ’78 regime which has officially erased the public memory of political repression. The 1978 post-Franco settlement ensured that the new Spanish state would not officially recognise Franco’s treatment of political prisoners, or even his mass graves. Even now, the Spanish state actively works to oppose any efforts to record and recognise the bodies. Indeed, because the ’78 regime enabled Franco’s elites to consolidate their power and then expand through a combination of post-Franco privatisation and the preservation of close links to the ruling parties, particularly the PP, corruption can be said to be integral to the postfascist oligarchy. Indeed, it was the unavoidable fact that corruption is integral to the regime that eventually brought down the Rajoy government on 31st May 2018. The 1977 ‘Amnesty Law’ gave an official amnesty to Franco’s political prisoners at the same time as granting impunity for crimes related to the regime. Civil servants who played a key role in the Franco dictatorship, judges and police officers – including those who had tortured countless civilians – quietly remained in place under the terms of the post-Franco amnesty. This continuity of personnel, coupled to the institutional amnesia about Franco’s mass graves – Spain had the second largest number of ‘dissappeared’ in the 20th century after Cambodia – ensured that the institutional culture of fascism went unchallenged inside the state. The ease with which Spain convicts political prisoners and forces politicians into exile is a mark of the endurance of the culture of the dictatorship in which the judiciary were politically motivated and politically compromised. The crime of rebellion used by Rajoy, and the current government to detain political prisoners was a 19th century offence, brought back by Franco in the 1940s to prosecute and execute thousands of opponents using his military courts. We are not claiming that the practice of imprisoning political opponents and forcing people into exile remotely resembles the scale of violence experienced in the Franco period, but it is crystal clear that this practice reflects the modus operandi of the dictatorship very precisely. This is certainly not fascism either in its official guise, or in practice. But it is post-fascism. And it is the post-fascist structure of power that explains why the independence movement in Catalonia is not going to be broken easily. Join us for the Edinburgh launch of Building A New Catalonia, with Mike Small & Ignasi Bernat and contributors from the book on Wednesday, Apr 10 2019 19:30 – 21:30 at The Counting House, West Nicholson Street, Edinburgh. A vibrant, thoughtful, incredibly timely new book, Building A New Catalonia articulates the political strategies and aspirations of the anti-capitalist, feminist and socialist struggles for self-determination in Catalonia in a series of 35 short and sharply written essays. 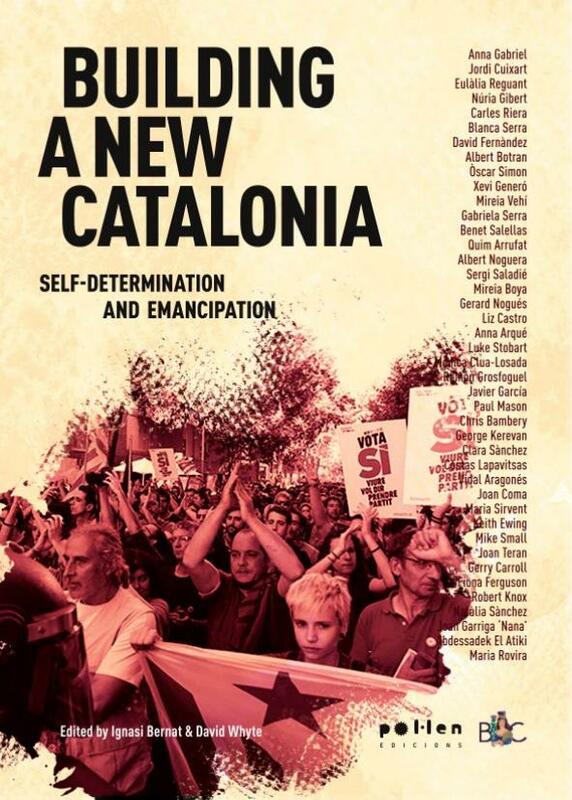 It brings together the leading voices of Catalonian left independence movement alongside key figures in the international solidarity movement. The book includes chapters by Catalan political leaders including Jordi Cuixart (currently in jail awaiting trial for sedition), Liz Castro and David Fernandez, and prominent international contributors including journalist Paul Mason and economist Costas Lapavitsas. I’m pleased you have given a balanced account of the Spanish situation as there has been a lot of hysteria about ‘fascist’ Spain. Rajoy certainly represented the far right dregs of the Franco Regime and his reaction to the ‘coup’ against the Constitution was well over-the-top and the results were just as used to happen in the 1970s when I was first there. 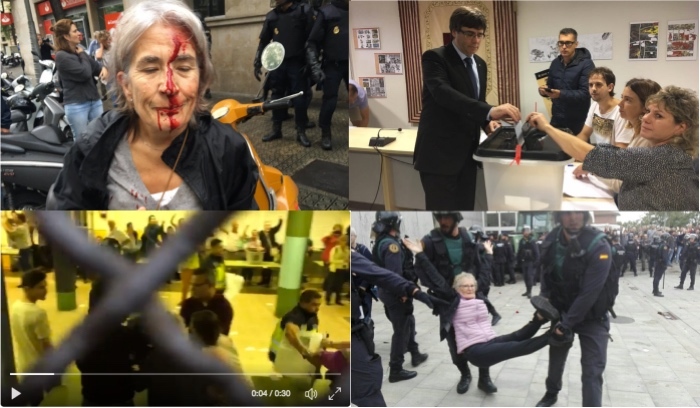 Nevertheless, the right-wing Puigdemont with his cobbled-together PDeCAT party plus the other independence parties were warned by their own Mossos police and their parliamentary lawyers that the vote would be illegal and would provoke violence. Perhaps that is why, once the illegal vote took place and Puigdemont declared independence, he said it was only “symbolic” and ran for the border and Belgium, leaving the leaders of the left-wing parties of the alliance to rot in jail. The country is split down the middle and the independence movement has not had a 50%+ majority – even the votes that were counted represented only two out of the five million citizens, so that the so-called ‘massive majority’ was not representative – also the number of votes to gain seats in their parliament are weighted towards the rural constituencies, so most urban centres do not have a pro-independence majority as far as the popular vote is concerned. The idea that Catalonia is ‘repressed’ culturally is something I find strange: the language is compulsory in schools and universities (foreign students taking courses in what they think is Spanish are often astonished to find they can’t understand a word; the children of Spanish immigrants from the south of Spain who helped build the economy are supposedly allowed 25% of classes in Castilian, but that is rarely the case if teachers are unwilling ); it is the richest of all the autonomies, so one would expect that they should pay a larger share back to contribute through national taxation; Puigdemont, as well as the current far-right president Torra, talk of Spanish ‘fascist’ corruption, yet the CDC from which PDeCAT were formed is currently in court for corruption and the Alliance of Liberals and Democrats for Europe (ALDE) are now discussing expelling PDeCAT from their group in the European Parliament. When my father-in-law was elected an independent Senator in the first democratic parliament and helped produce the Constitution, he told me it was the only way to heal the division of two centuries that had torn Spain apart in civil wars between liberals/republicans and monarchists/fascists. The two longest-serving ex-presidents of the new democracy, the left-wing González and right-wing Aznar, recently appeared together and put forward the idea that Spanish democracy had to make concessions on both sides and the Constitution had done its job of keeping the country together (even despite the attempted coup by the Civil Guard Tejero and right wing military, luckily defused by the king himself as commander-in-chief … perhaps the only saving grace of his reign). The key point, though, is that over 90% of Catalans voted to accept the Constitution; democracy has only been in Spain for around forty years and the country is still not stable with Basque terrorism only recently renounced, providing no apologies for the deaths of 800+ civilians on the ‘other side’, and continuing threats against opponents rarely mentioned by the press as in Northern Ireland. Like the NI Brexit problem, Puigdemont’s mad idea of undermining the Constitution now, instead of playing the longer-game as advised by his predecessors, is an intentional ploy to jump on the bandwagon of the other right-wing populist nationalist groups in the rest of Europe (Torra has previously shown his xenophobic side in utterances about purity of Catalan blood and Spanish degeneracy). No wonder that the ERC leadership in jail are at odds with Torra’s intentions and would prefer a path of dialogue with the current left-wing government who, like my father-in-law, have never said the Constitution could not be revised and more autonomy/home rule negotiated (cf. the Faroese who have negotiated virtual independence from Denmark over several decades). The problem with Torra is that, like the DUP in NI, he is too eager to use his leverage over a minority government rather than thinking of ALL Catalans and not just the 49%. Thanks again for a well-balanced assessment and I hope the above at least shows that things in Spain are not as B&W as poorly informed people would have us believe. As I have said elsewhere, I think it dangerous for Scotland to align itself with what is a suspect right-wing, populist nationalist party that does not represent the other half of the Catalan population. Thanks for that extremely interesting and informative post. Mike – not sure we read the same article. As a long-term Catalan resident, I question your damning of the Catalan grass roots movement as right wing, populist or party-driven. It’s not that independentist politicians haven’t made many mistakes, but to reduce them to the profiles you give is not just unhelpful its inaccurate. Catalonia should never have had an independentist movement, we can probably both agree on that. But when all else has failed, it’s hard to know where else to go. There’s a whiff of unrepentent totalitarianism in Spain’s decision to ignore its thousands of mass graves, and on another level altogether an intransigence in its obsession with a High Speed Train network, second only to China, to tie even small cities to Madrid. And this in a bankrupt country. In other words, there’s only room for one ideology, one centre, one patria. This squeezes out the second capital, and state resources are being harnessed to ensure that Barcelona is reduced to size. The railway metaphor is not irrelevant, Mike, it is just a sign of what the peripheral autonomies in Spain are up against – “Spain, capital Paris” (Bel), or “Madrid is an island, a state against its citizens” (Pazo) neither available in English I think, give the flavour of a deep state drive towards total hegemony of the capital. So what I’m trying to say is that independentism is a symptom not a disease. Denying that there’s a problem won’t help solve it. The AVE trains in Spain are fantastic. I am massive fan. I spent most of the summer going up and down the Atlantic line from Coruña to Santiago, to Vigo and to Oporto in Portugal. In Scotland, the line of the world famous West Highland Way is not even electrified. The bathrooms of the trains are filthy, as are the carriages themselves. The standards of comfort are 1970’s level..
irresponsible political agents at the top. I am currently in Madrid watching the fallout from the anniversary of 1-O, where a totally incompetent Torra first encouraged the militant republican groups to ‘lay it on again’ and then put his own Catalan police, the Mossos, in danger when the same militants tried to storm the Catalan parliament to demand his resignation, having previously allowed the Mossos to charge them on Saturday when they started rioting. The republican left ERC and anti-capitalist CUP have now disasociated themselves from the president and the police themselves are demanding the resignation of the head of police and interior minister. Puigdemont was more centre-right, but Torra should never have been his puppet replacement. He asks for dialogue, but continues even today to dogmatically demand independence on his own terms to keep the militants on his side. Confrontation without dialogue and rule of law will not lead to self-government, which is why the republican left are disavowing the forced independence route and have done so for many months. I fear similar divisions are increasing in the case of Scottish independence (which I back, despite originally coming from the north of England), complicated even more by the inanity of Brexit which is increasing the sense of xenophobia which I had never felt in Glasgow for the last 40 odd years, and all part of the right-wing nationalism threatening us everywhere. My sense of déjà vu is such that I shall probably end up living out the rest of my days in Spain, as (believe it or not) I find the English-centric UK of today more surveillance-crazy, repressive, neo-fascist, and anti-foreigner than I did here under Franco in the early 1970s! My advice to Bella Caledonia, and my hope also, is that Bella does not go down the way of the Spanish media on the issue of Catalonia, where lies, lies and more lies are told on a daily basis by both sides to the point where you just give up. The Spanish and Catalan media, with one or two exceptions like the newspaper El Diario, have never debated the issue of Catalan independence properly. They simply repeat their respective propaganda to the point of utter tedium. This article is a case in point. It is full of tendentious claims, misleading information and omissions – for example, the Spanish flag was created about 150 years before Franco was around, who added the black eagle to it, which was removed after democracy was restored in 1978….and sure, it’s bound up with Spanish militarism and empire, but not as much as the Union Jack is, for example..
One thing is true beyond any doubt about the last year in Spain. The people responsible politically in Madrid, and the people responsible politically in Barcelona have both acted with a complete and total disregard for democracy and are simply not up to the jobs they were paid to do. Rajoy and Puigdemont, and their lackeys in the press and the Spanish courts and the police have managed to create an intractable problem in Catalonia, and for European democracy at large. It will take decades to solve probably. We have a lot of big issues to deal with, like the migrant crisis, and Spanish democracy has let everybody down. Both Rajoy and Puigdemont went back to the old way of doing things in Spain, which is to be willfully confrontational, irrational and undemocratic. They both deserve the contempt of any democrat in my opinion. As for this book, no doubt it will be yet another example of the Scottish Left’s love-in with Catalonia. And say what you want, but Catalan Autonomy is much more wide-ranging than Scotland’s is, and is also guranteed by the Spanish Constitution. So nothing at all like Scotland’s devolved parliament and its resolutions, which can be ignored and even removed at will by London…. Also, I’m not sure I see anything to be gained by using a term like “post-fascism”. Spain, on paper, is a democracy, without any question at all…. What Spain suffers from is “sociological Francoism”… a way of seeing the world which is the result of 40 years of Francoist brainwashing and a ruling caste which is very closed and narrow and consists of a few hundred families and their appointees. Francoism is a kind of fascism, sure, but it’s not a fascism like Hitler or Mussolini’s which have a clear ideology, and in the case of Hitler, a racial ideology. The Falange was Spain’s version of fascism, but Franco sidelined the Falange once he saw that the Axis powers were going to lose the Second World War. He used the Falange to win power, and he used the monarchists to win power, and he betrayed them both. Franco is like a dictator out of Garcia Marquez novel…. Some people don’t seem to understand that, from the first day that the II Republic was declared in April 1931, a group of Spanish military plot the overthrow of the II Republic and to restore the monarchy…. the original impulse of the coup is to restore the monarchy. since which there seems to have been a weakening of the association between Catholicism and the inheritors of the Francoist tradition. It’s interesting that in this part of Spain’s transition to democracy they are ahead of the UK, where I wonder what effects disestablishment would have. So is it the case that religion is now considered more of private matter in Spain, and is there less public will for State support for Catholic education and cultural predominance? Is Spain on course to become secular? And how does religion fit into the Catalonia question? A huge part of the problem with authoritarianism in Spain and the backward mentality of the Spanish ruling elite undoubtedly lies with the fanatical and totally corrupt Catholic Church.. This is interesting because it means that people cannot reasonably claim that these issues were not contested back in 1550–1551. So on that basis, the Catholic church in Spain may have inherited a centuries-old ethical debate about the evils of imperialism (where the Church was an engine of conquest) and the right of self-determination. So I wonder if these issues are being rekindled these days, and if Spanish Catholics are divided on such issues.